This award is intended to encourage expedition and mobile activity. In recognition of the help given to W.A.B., there is no fee for this award. 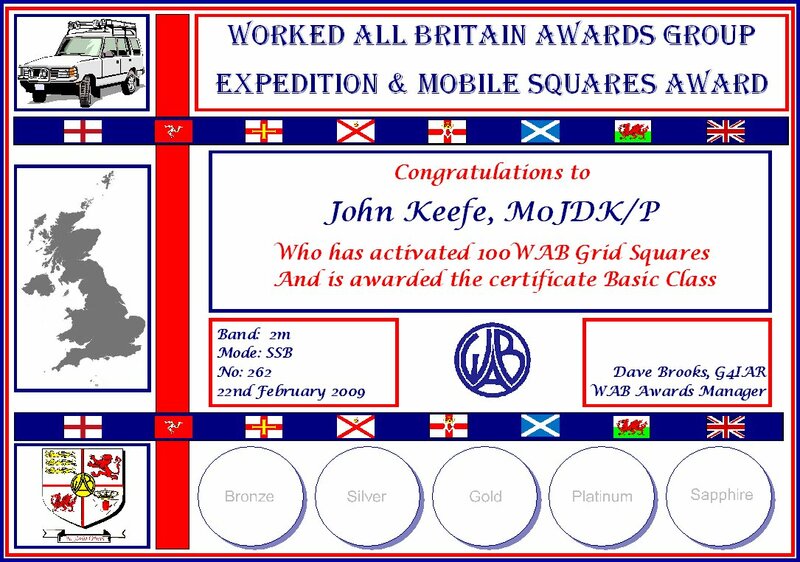 The award is issued for activating W.A.B. Squares. You must make a minimum of one contact for W.A.B. purposes from each square activated and be prepared to attempt to work each station monitoring your frequency. For a square to be activated the operator, transmitter, receiver, microphone or key and the whole of the aerial must be located either on land in the square or in a vehicle in the square. If the vehicle is a boat, it must be on an inland waterway. The square must contain land at the time of activation. Only if it is not practical for the whole of the aerial to be in the square, the feed point must be in the square. The person operating, the person navigating, the person logging and the person driving can claim activating the squares. Navigating and logging means from within the vehicle or at the portable site. There are six classifications for the WABEMA award. Basic (100 Areas), Bronze (200 Areas), Silver (400 Areas), Gold (600 Areas), Platinum (750 Areas) and Sapphire (900 Areas). Claims can be made using the W.A.B. 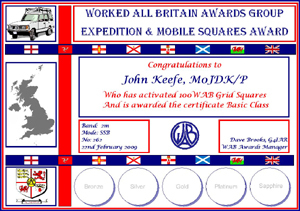 Squares Award claim form.